with MGMT - The hot indie rock duo! 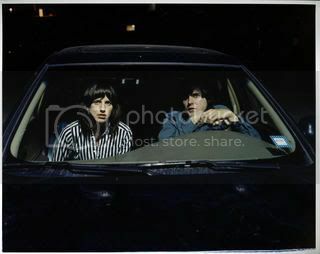 Lead by siblings Eleanor and Matthew Friedberger, Fiery Furnaces are a five-piece band with a sonic twist. Unusual song structure, piano solos, hammering drums that sometimes give away to dance floor hooks... The group are on the edge of what bands are doing these days. Eleanor and Matthew Friedberger in town tonight! I do not yet have the Fiery Furnaces' new album "Window City" - but I can highly recommend their last two full-length album releases: Bitter Tea (2006) and Blueberry Boat (2004). There is an "all in the family" tie between Fiery Furnaces and opening act MGMT and that tie is Kevin Barnes, singer of the indie rock band "Of Montreal." Barnes is a huge, unabashed Fiery Furnaces fan and he covers Fiery Furnaces track "Tropical Ice-Land" on the road. Barnes just tapped MGMT for the opener for Of Montreal's latest tour. I actually saw them just a few weeks ago opening up for Kevin and the band at the Roxy here in Boston. It was the biggest boost of MGMT's young career. The indie rock band that has people listening. They like kittens. Andrew VanWyngarden and Ben Goldwasser are a pair of highly motivated Brooklyn musicians performing electro-pop as MGMT. The band was getting some notice (Kevin Barnes for one) with Cantora Records. Of Montreal then gave them a shot, as opener, on tour. A major record label took notice and signed the band. The rest, as they say, is current events. It remains to be seen if the band will continue to live up to expectations. It can't hurt playing two tours with top indie rock bands in consecutive months. Fiery Furnaces and MGMT play Great Scott in Allston tonight.